Here she is: Piper the elf from jacket art for Escape from Netherworld—about a group of role-playing gamers who are somehow transformed into their characters and transported into an alternate realm: Netherworld. My pal, the extraordinarily talented Gina Datres, is the book’s designer and she called me in to illustrate the jacket. After some discussion and rough sketches back & forth we hit on the idea of 3 individual images of the gamers going through their transformation. For the 2 guys, Twiggy and Borhai, I drew the gamers in pencil but fully rendered their characters in paint. I work with watercolor (gouache), so I traced some of the drawing with a wax candle. Since watercolor won’t stick to wax, you can see the drawing of the gamer ‘through’ the painting of the character. Piper, the elf-girl, doesn’t change in size enough to make that idea work so I made her hair a magical element that swirls around her as it grows. As usual, here are the rough sketches, tight sketches, color study and final painting. Hey, gang! Sorry for the interruption in posts—I spent most of last week in New York City visiting art directors, editors and creative directors. Now I’m back and I want to show you something I worked on this summer. 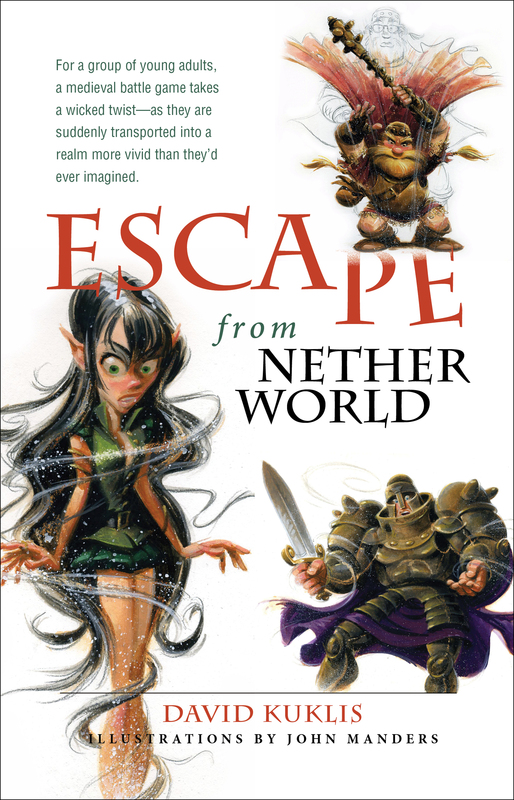 Here is jacket art for Escape from Netherworld—it’s about a group of role-playing gamers who are somehow transformed into their characters and transported into an alternate realm: Netherworld. Let’s start with Twiggy the dwarf. As usual, here are the rough sketches, tight sketches, color studies and final paintings.